While it is no longer on the current liturgical calendar, the feast of St. Peter in Chains was a feast day commemorated on August 1st to recall St. Peter's miraculous release from imprisonment and the dedication in the 4th century of the church Pietro in Vincoli - St. Peter in Chains in Rome. 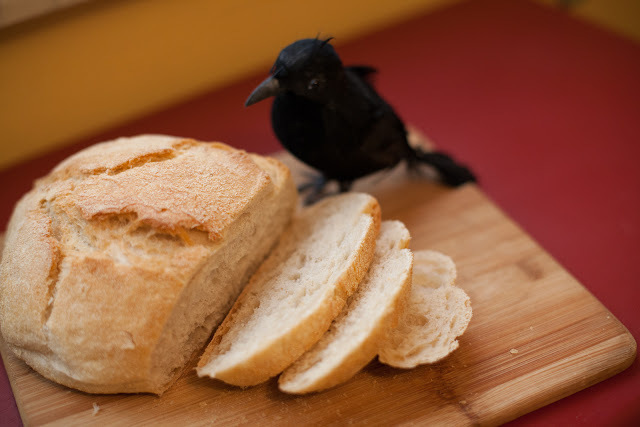 Last year I posted this St. Peter in Chains Feast Day Bread recipe as an idea to commemorate the feast. 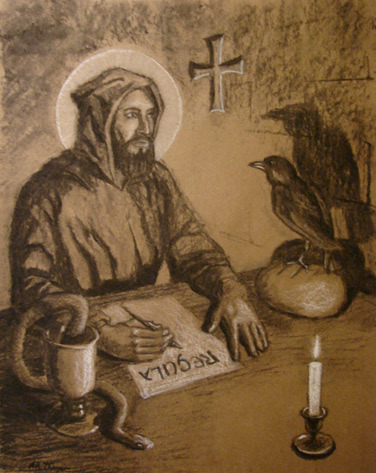 Since God knew that man is enticed by favours, he wished to bind him to his love by means of his gifts: “I want to catch men with the snares, those chains of love in which they allow themselves to be entrapped, so that they will love me”. So another "link" to making chain related feast day foods for August 1. Heat oil to 350 degrees. Separate the ¼ inch slices of onion into separate rings. Mix egg and milk, whisking until combined. Combine flour, salt and baking powder in another bowl. 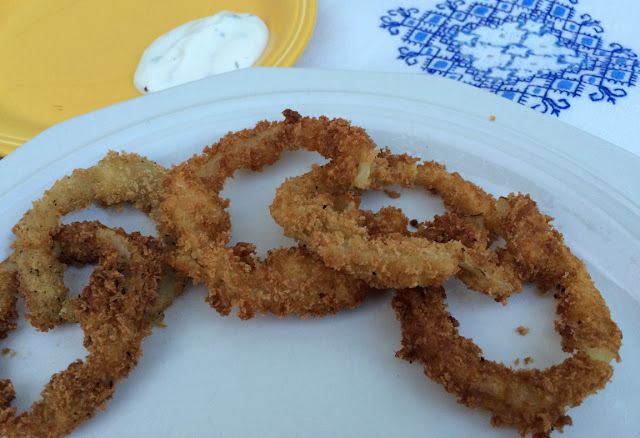 Dip onion rings in egg mixture, then in flour mixture. Dip the flour-coated onion rings back into egg-milk mixture a second time. Place on a wire rack to let excess egg-milk mixture drain. Place dipped onion rings into Panko bread crumbs and coat completely. Drop in hot oil and cook 1 minute per side until golden brown color. Place on a paper towel to drain excess oil. Sprinkle onion rings with salt to taste. Serve either as individual links or cut the links so they open and link together several onion rings for a chain of onion rings. Serve with ranch dressing or spicy dipping sauce. St. Peter in Chains, Pray for us. No time for anything fancy on the feast of St. James? Still want to make it fun? A really simple idea is to just serve anything in a scallop shell. Since I had purchased the large shells for the Coquilles St.-Jacques dish, I realized how fun it would be to use for any serving on St. James day. The shells are available at many craft stores and kitchen stores, as well as online outlets like Amazon. Try serving up a condiment or spice like sea salt pictured here. The scallop makes a nice sized side dish for serving up salad or fresh fruit. A fun dish for snack time, apple slices, orange wedges, carrot stick, etc. Pictured here are goldfish crackers since St. James was both a fisherman and a "fisher of men." It is a great little dish for a dessert, like ice cream for a warm July evening. The possibilities are numerous. Enjoy! The scallop shell is a common symbol of St. James and is associated with travelers/pilgrims especially on the Camino de Santiago. Earliest connection of the scallop shell to the Camino and saint James is dated in the 10th century. The shell is commonly found on the shores of Galicia and served as a proof of completion of the pilgrimage. In a practical sense, the shell was the right size for gathering water to drink or for eating out of as a makeshift bowl. There is a legend with a couple versions linking St. James to the shell. One says that after St. James' death, his disciples took his body by ship to the Iberian Peninsula to be buried. Off the coast a storm hit the ship, and the body was lost to the ocean. After some time, the body washed ashore undamaged, covered in scallops. Another version states, that as the ship carrying St. James' body approached land, a wedding was taking place on the shore. The young bridegroom was on horseback, and on seeing the ship approaching, his horse got spooked, and the horse and rider plunged into the sea. Through miraculous intervention, the horse and rider emerged from the water alive, covered in seashells. There are two metaphors I have seen for the shells. The grooves in the shell, which come together at a single point, could represent the various routes pilgrims traveled, eventually arriving at a single destination at the tomb of Saint James in Santiago de Compostela. The scallop shell could also represent the pilgrim. As the waves of the ocean wash scallop shells up on the shores of Galicia, God's hand also guides the pilgrims to Santiago. Whatever the meaning – the various symbolism and stories associated with the scallop and St. James, make it a great visual for the feast day. Coquille is the French term for the scallop, and also refers to a classic French dish with scallops prepared in sauce and served in a scallop shell. The scallop shell is the traditional emblem of St. James, son of Zebedee and has long been the badge of pilgrims on the Way of St. James to Santiago de Compostela in Spain. There is a traditional Coquille St.-Jacques which is made with mushrooms and wine sauce. 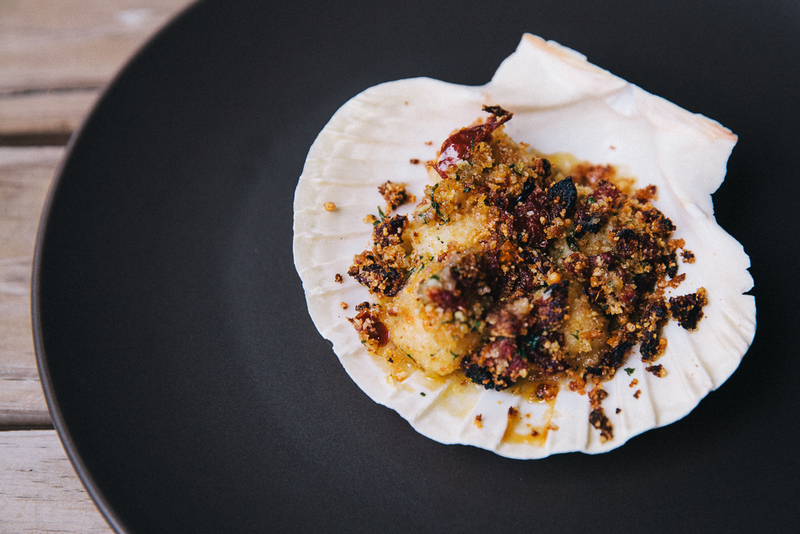 This is a different baked scallop recipe, which includes sun-dried tomatoes which are red as a symbol of a martyrdom on this feast day. Served in a scallop shell they are a fitting meal for the feast of St. James. Chop the parsley and garlic and add to breadcrumbs. Add the parmesan cheese, sun-dried tomato pieces, salt, pepper, and olive oil. Mix well. Add the scallops and mix to coat. Fill each shell with the mixture of breaded scallops (approx. 5). Place on baking sheet in 425 degree oven. Bake for 10-15 minutes until scallops are done and breading crisps. Serve in shells.